The cost of rent can vary wildly from neighborhood to neighborhood. The graph below shows a heat map of the median prices by zip code in Los Angeles. 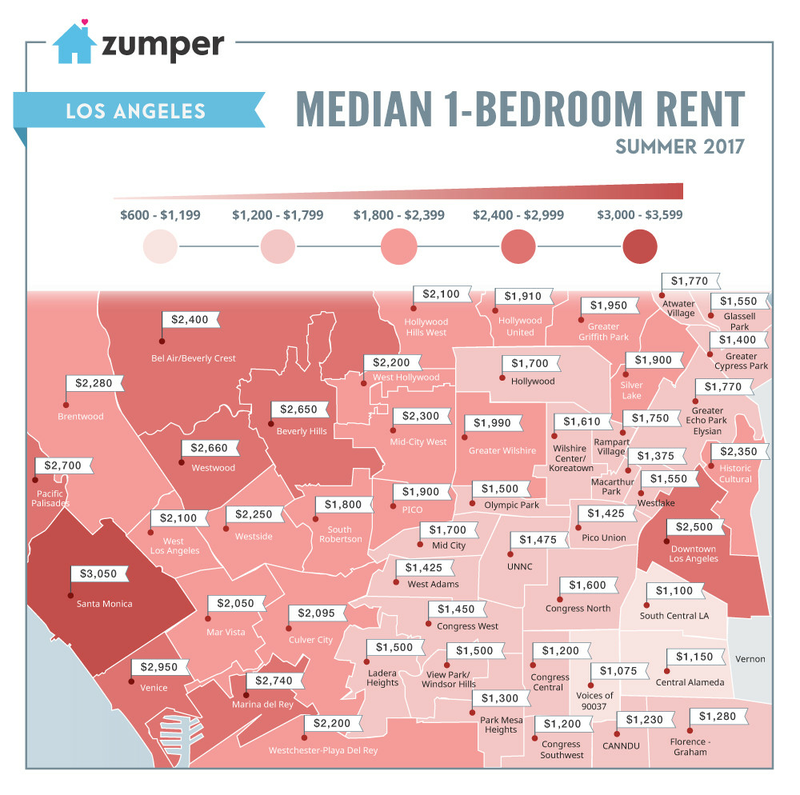 Rental website Zumper has released a map showing where rents are highest and lowest in Los Angeles. The high cost of rent has a dramatic effect on the cost of living which is compounded by high income taxes in the state of CA. In other words, not only do you have to cover the higher rent, you need to earn more pre-tax income than you would in a state with lower taxes. The prices are based on one-bedroom apartment listings featured on Zumper’s site, so they may trend toward higher-end developments. The map certainly gives an idea of which neighborhoods are in demand with those looking for a new place. The most expensive area on the map is Santa Monica where median rental prices are $3,050 per month. Neighboring beach communities Venice and Marina del Rey aren’t far behind with prices hovering around $2,950 and $2,740, respectively. Download the only cost of calculator City Vs City to actually account for these differences in median housing costs at the ZIP code level! Or continue reading about the differences here.